With the changing guidelines and vessel requirements we are committed to Leading the Way as your Stern Tube Seal supplier. Our custom formulated Versiton FKM is compatible with all conventional and synthetic oils, as well as EAL oils on the following sheets. We are continuing to test additional oils, and will update our documents as required. If you would like an updated list please contact: eal@versitec.ca. 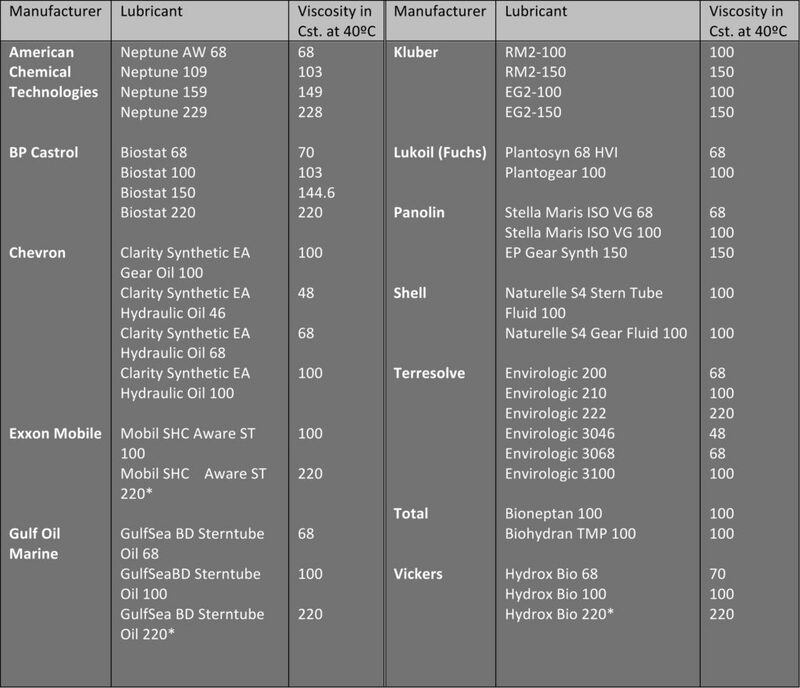 This is to inform users of VERSITEC MARINE’S Vanguard spare parts that this is an updated list for which EAL Oil’s have been tested to date. We will continue adding EAL’s as & when each test has been completed. We have confidence due to our R&D process that all EAL’s, Mineral, and Carbon-based Oil’s are compatible with Versiton FKM material. We have had no failures to date, and do not expect any. MIXING DIFFERENT OILS IS NOT ALLOWED! It is the responsibility of the lubricant manufacturer to provide statement that the aforementioned EAL Lubricants are compliant under the Vessel General Permit (VGP). VMI does not guarantee these statements, and does not take responsibility for such claims made by the manufacturer. Please consult the lubricant manufacturer for confirmation. Though VMI Versiton FKM sealing rings are of a superior compound and compatible with these noted lubricants, along with Petroleum based lubricants it is not recommended that our NBR/HNBR sealing ring materials be used in combination with any EAL compliant lubricants. VMI considers it technically not feasible to change from non-EAL’s to an EAL without changing the seals. They should be changed at all times when converting your oil to an EAL. All recommendations for specific EAL’s is not assumed by this list. Please consult specific makers of other parts and equipment (i.e. CPP Propeller) to guarantee compatibility of desired EAL with the equipment in question. VMI does not expect any negative changes with regards to the lifetime of seals due to the use of these listed oils. The compatibility of results is through a static test in a laboratory showing the lubricant is compatible with VMI Versiton FKM sealing rings. Please contact us directly if you would like any clarification on this document, or would like to discuss the use of other lubricants which are EAL Compliant under the VGP.